I had actually finished this book a few weeks ago but I had to prioritize a few ARC reviews before getting back to this book. It's a sort of service to independent writers. Back on point, The Book of D'ni is the third and final book in the Myst trilogy of prequel novels. And while I don't think that these books are the sort that I'll treasure forever and ever and perhaps re-read on a regular basis, they're still pretty fun, especially for old school Myst fans like me. And this book gets a lot closer to answering a lot more of my questions when I started reading this series of novels, although it does so in a manner that was a little roundabout. I can understand how the folks behind the game wanted to be a little careful in terms of how they handled these books and how much they would reveal versus the original games. That's a tricky balance for anyone to strike when crossing different media formats. But in the end, the books still revealed a decent amount about the back story of the video game series and we fans are all the better for this added content. 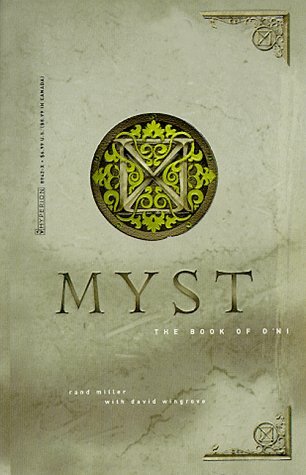 Synopsis: The Book of D'ni is the third and final book in the Myst trilogy of novels as written primarily by David Wingrove with the guidance of Myst creators Rand and Robyn Miller. This particular book is set after the events of Riven but before the events of Myst III: Exile. Atrus has been reunited with his beloved wife, Caterine, and the two have ventured back to K'veer in order to finally explore the rest of the abandoned city of D'ni. Atrus has one goal in mind - to restore the D'ni civilization. But the first step to doing this is to search the dead city for any of the magical Books that link to all those other Ages. When the catastrophe covered in The Book of Ti'ana took place, many people of D'ni tried to escape to their respective ages. But plague bodies has been sent off into those worlds as well, thus it is uncertain who might have survived in those other worlds. The real meat of this particular book is when the Atrus and his fellows finally discover a truly great Age - that of Terahnee. It's an age that appears to be even older than D'ni itself and is inhabited by a sort of offshoot race with whom the D'ni people share a common ancestor. And this practically Utopian age is also ruled by a group of Writers capable of writing Books that link across the stars. But this age has secrets of its own and the truth of their success may undermine everything Atrus had been working toward. As is the challenge of most of the books in this series, there's an unusual lack of balance in terms of how much content the book manages to cover. The first novel felt a little short and lacking substance and meat. The second book was a nearly epic journey following some practically immortal D'ni over centuries. And this final book seems even longer as it tackles the D'ni restoration efforts and a very long adventure in Terahnee. When you read the synopsis of the book as it appears on the back cover, you'd think that the book is only about the Terahnee side of the story. And in many ways the first half of the book was nothing more than just a very long preamble as they wandered around D'ni and experimented with the various Ages. And while it was a nice piece of word-building in itself in terms of recovering the nearly lost knowledge of the D'ni, it didn't contribute all that much to the core story on Terahnee apart from finding it in the first place. And the Terahnee story was a little odd as well give how we seem to nearly forget the mission related to the restoration of D'ni and instead get all excited about this Age being practically perfect. Atrus loses sight of everything else in favor of finding a place for his people on Terahnee, which seems like an odd way to continue on with this primary goals. It's a decent enough story on its own, at least for the most part. Terahnee has some pretty major complications that really present a darker side to their supposed utopia. Good development there. Good plot twist. It just takes so long to get this far into the book for this narrative. And that's my main gripe here - we could have edited things down, but there was a clear desire to squeeze in more content and try to cover other parts of the back story of the games. And we still don't learn all that much more about how the Books early work and all that sort of stuff. But then getting a better explanation of The Art. The Book of D'ni is a decent enough way to wrap things up, I suppose, and it was a certainly an interesting enough adventure involving Atrus and Catherine. We get to explore the D'ni mythos through Terahnee as a point of comparison - what a race of Writers can turn out to be. And the book is fun enough to merit 3 complex procedures the Guild of Maintainers used to explore dangerous Ages out of a possible 5.